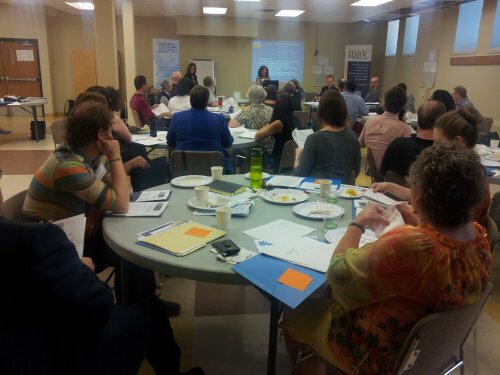 On a bright and warm day in Winnipeg, the Canadian CED Network gathered for our annual general meeting. Held at the St. Matthew's Community Center, over thirty-five people attended, along with representatives from Newfoundland, Edmonton, Saskatoon, Calgary, Victoriaville, Montreal, and Quebec City, who were able to join virtually. CCEDNet President Carloine Lachance led the meeting, and governance expert Yvon Poirier was on hand to present new by-laws. With formal business taken care of, substantive discussions on priorities and directions for the Network will be held at the Social Enterprise World Forum in Calgary from October 2-4. Time will be set aside for our members to get together to network, learn, and discuss ways to continue to build a strong national CED network. We look forward to the opportunity to gather with a diverse group of members from all over Canada at this great event. Click below to read our annual report for 2012.